Vernon CMS is a mature Collection Management System that is flexible enough to grow with your needs. With a focus on cultural organisations, we offer powerful and reliable software backed by excellent support. You can download a brochure about Vernon CMS. Read or download a summary of Vernon CMS features. Find out what you can add onto the Cataloguing module. All the technical information to view or download. Vernon CMS is modular. You can tailor the system to suit your collection, your specific needs and your budget. Over time, we have introduced add-on modules to perform specialist functions, such as detailed activities management, online publishing and RFID location tracking. Only pay for the licences you need. You can create as many individual logins as you want and access the system through any number of workstations on your network. User licences are for concurrent access – limiting only the number of users that can be logged into Vernon CMS at the same time. Managing your collection often means getting information from different parts of the database. Vernon CMS lets you open several windows at once. You can click to open records in related files. User views let you create custom windows to show select collection data in a dedicated window. Vernon CMS can be customised to meet your specific needs. Vernon Systems can develop customised data entry windows. These present only those fields relevant to your needs in the sequence and layout which best suits you. We can also build customised reports, email templates and calculated display fields. You have the freedom to manage user access and allocate rights to view or modify collection data in any field. Administration rights also give access to the audit log where all changes to the database are listed. These changes can be “rolled back” if necessary. Your data is on a local server. As such you can get to it even if your internet is down. One fixed cost for all software upgrades and updates. You get access to our Customer Support Portal. Here you can ask questions, read the forum and interact with our user community. Our support gives you direct phone and email contact to our experts. Choose the best way to share your collection. There are many different ways to publish your collection online. We want to work with you to achieve the best outcome and have two great products to make it happen. Retrieving collection data is quick and powerful. Vernon CMS has built-in search and retrieval options. You can perform a quick search at any time on the main screen, or open up the query window for a deeper search. The Cataloguing module forms the cornerstone of Vernon CMS. It fulfils the basic needs of collection management and presents an intuitive user experience to nine interrelated databases. It comes complete with over 400 fields, multimedia, searching and reporting. Vernon CMS has a built-in reporting tool. You can make reports on the fly, or craft the perfect report and save it as a template. Sent data to Microsoft Word or Excel, or export in a range of formats. We offer a range of methods to integrate with other software. Online collections, kiosks or mobile apps can be keep up to date. Data export formats are compatible with most third-party software. Web Messenger and Browser modules both automate integration. Multimedia facilities are fully integrated at no extra cost. Any number of images, sound files and videos can be linked to any record in any file and the same multimedia file can linked to any number of related records. Record and manage your donor and maker information within your CMS. A powerful people database allows you to create detailed records for any person connected to the collection. Tasks and costs can be associated directly to each person, and people (including donors or members) can be searched, grouped and assigned to mailing lists. 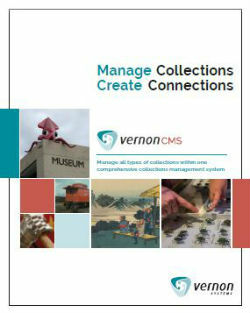 Download a PDF of the Vernon Collection Management System brochure.